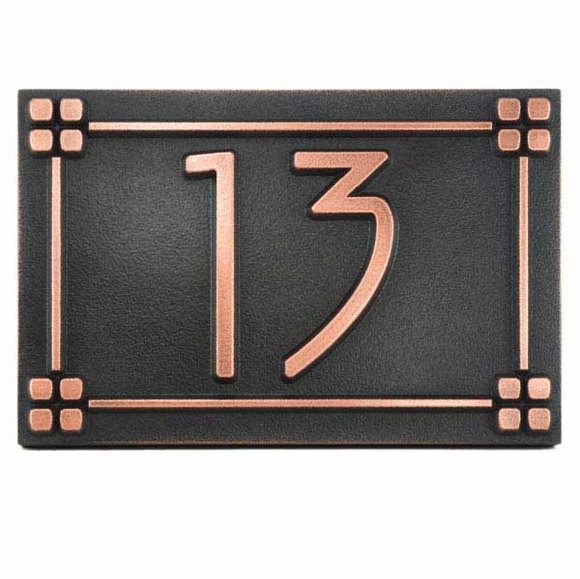 Prairie Style Address Plaque - - stunningly simple and sophisticated. Decorative and uniquely American 16"W x 10.5"H personalized address sign. Made in USA using American materials and labor. Signs are an impressive 1" thick. Stunning raised Arts & Crafts font. The font is shown in the large image, and the raised feature is clearly shown in the middle small image. Seven upscale metal finishes: bronze patina, bronze verdi, copper patina (shown in large image), copper verdi, brass patina, silver nickel, and pewter. Wall mount horizontal sign includes a one, two, or three character address in the classic Arts and Crafts font as shown above and distinctive raised lettering. Single line border broken with a cluster of mini-boxes in each corner.